1 in 8 women will develop breast cancer in their lifetime and the threat of breast cancer increases if her mother, sister, and/or daughter has been diagnosed with the disease, specifically if diagnosed before the age of 50. My mother and aunt both passed away from Breast Cancer in their 30s…. My sister was diagnosed at the young age of 30, and made the courageous decision to have a double mastectomy. Breast Cancer is something that impacts my family every single day. Statistically, if two first-degree relatives develop breast cancer, your risk is more than 5 times the average risk. Do I have fears? YES… But, I release them knowing I am doing all that I can to prioritize my health, such as eating healthy, staying active, and making healthy lifestyle choices, with regular check-ups and mammograms. In addition, I practice a holistic approach to wellness, including meditation, energy work, acupuncture, massage and daily writing. I do all that I can to stack the odds in my favor, stay positive and mentally strong. Regardless if you have a family history and are predisposed to the disease or not, I URGE YOU to prioritize your health!!! Early detection and screening is the best prevention for everyone. If you are “high risk,” look into programs available to you, which include screening, diagnostic tests and monitoring …Remember to “THINK PINK” all year long, not just in October! It is also important to encourage friends, family members and siblings to prioritize their health and act as if their appointments are your own. I am the first to admit, I can sometimes be in denial about just how serious the threat of developing the disease is to me…I sometimes don’t want to go to my appointments. 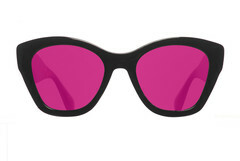 They can be uncomfortable and bring up painful thoughts and memories. It is always the encouragement and support from those around me that reminds me its not just about me. I am part of a family and community that I can’t let down and I don’t want to be another statistic. I have to be strong for others. This is why I am sharing my story and hoping you will inform or urge just one friend to make an appointment, dive deeper into their family history or make health more of a priority….You just may be the earth angel helping to save their life! Please also check out The Pink Agenda as a fantastic resource to learn more about what you can do to safeguard your health, and purchase tickets NOW for their Annual Gala, taking place this Friday October 16th. Attendees will #RaiseHell and donate proceeds of the event to Breast Cancer Research. I will not be able to attend the event this year, but you will find an exclusive Balanced Beauty Health Coaching package up for bid to support this great event and cause! 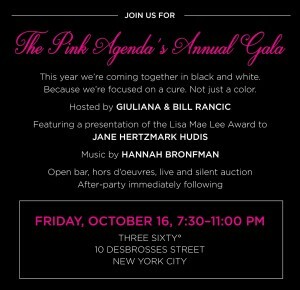 The Pink Agenda-ANNUAL GALA, October 16th in NYC- Get your tickets: HERE!